Wilma has a ruff lifestyle! She lays around in my office while I blog and build websites. Then she eats dinner and it is time for the local news. Her favorite time of the day, she can sit on the sofa with me for about 20 min, then she is off to her sofa and for a evening nap. Then it's time for bed and we start the next day back in the office. 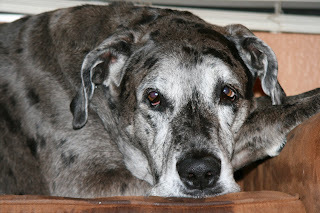 She is one of the prettiest Great Dane dogs I've seen. You sure took a lot of effort in taking care of it. Congratulations. All the effort is worth it.